Decision Making is an important function in management. Business has limited resources. One of the most important tasks of management is to allocate these resources effectively and efficiently to achieve the company’s goals and objectives. Decisions are taken to support organizational growth. The whole fabric of management, i.e. its day to day operation is rightly built on managerial decisions. Accounting information can improve the management understanding of the results of alternative resource allocation. That is, one of the major roles of the cost management information system is to supply cost and revenue data that are useful to tactical decision making. It is one of the major functions of management. Effective leaders apply critical thinking skills holistically to make countless decisions each day. It is a very important and difficult task of management. Decision making can be defined as making a choice between future uncertain alternatives. A short term practical decision making consists of choosing among alternatives with an immediate or limited end in view. It must be an emphasis that all decision making relates to the future and that a decision is a choice between alternatives in pursuit of objectives. Where no alternatives exist no decision can be made and nothing can be done now that will alter the past. Therefore, decision making is concerned with the future and involves the act of selecting one course of action from various courses of action. Recognize and define the problem. Identify alternatives which are a possible solution to the recognized problem and eliminate alternatives that are not feasible. Identify the predicted cost and benefits associated with each feasible alternative. Compare the relevant costs and benefits for each alternative and relate each alternative to the overall strategic goals of the firm and other qualitative factors. Select the alternative with the greatest benefit which also supports the organization’s strategic objectives. It is a process of making a choice from an alternative course of action. A decision is the end process preceded by deliberation and reasoning. 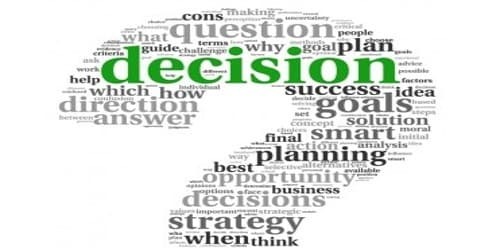 Decision-making is a focal point at which plans, policies, and objectives are translated into concrete actions.